I finally got some time yesterday, May Day, to start on labelling the vessels. I may have mentioned the process before but I’ll cover it again as someone asked me how I did them. Using Microsoft Word (or any Word Processor really) create a table, in my case I make one 8 columns by 2 rows to start with. Then insert a couple of blank lines in the document and create a second 8 column by 2 row table. Then a couple of blank lines and create a third table 8 columns by 2 rows. In the second table, record the name of each of the vessels in the fleet. Record them in columns 2, 4, 6 and 8. Font and font size does not matter at this stage. You can then copy the table over table three (so that in both tables columns 1, 3, 5 and 7 are empty and columns 2, 4, 6 and 8 now contain all the ship names). Highlight column 1 in table 3 (the ship codes). Now copy that and paste it into column 1 of table 1 and column 5 of table 1. Repeat this for column 3 table 3 (copy to columns 2 and 6 of table 1); column 5 of table 3 (copy to columns 3 and 7 of table 1); and column 7 of table 3 (copy to columns 4 and 8 of table 1). Now there are three tables with only table 2 having empty columns. We now start formatting, Firstly, table 2. highlight the table (all columns) and select font “Calabri”, click on bold, change font size to 6 point or 8 point. The size of the font is something you will need to guess to make sure when finished the label will fit in the bottom of the ship base – so destroyers may need to be smaller than capital ships. Next, search the internet and find the naval ensign for the World War 1 fleet you are painting (this is of course optional but adds a nice touch). Copy the image and paste it into cell 1, (row 1, column 1) of table 2. It will be very big but resize to until it is small and matches off with the text – you may need to adjust the column width here too. Play around a little and it will work out one way or another. Align the image either Center Left or Center in the cell. When it looks right, copy the image and paste it to each of the empty cells next to the ship names. Format the columns with the flags is to Center Left or Center alignment. Save the document. Now comes the interesting part. The sea bases I have painted are coloured with a base coat of Prussian Blue then a light blue dry brush and a white dry brush. I have found that a background colour of dark blue works – the colour details are for R:G:B colour 23:54:93. This matches fairly closely with the Prussian blue as you can see in the photo to the right. Now select all columns of table 1 and change the font to “Calabri”, the size to 6 point, select “bold”, select font colour “white” and then select fill colour –> more colours –> custom and use the R:G:B figures mentioned above. Your sea base labels should be starting to look good. Whilst the table is selected, go to design –> borders and turn borders off. The last step with the blue labels is to select columns 5, 6, 7 and 8 from table 1 and amend the character spacing, This is done so that the labels will fit the smaller label tabs on destroyers, torpedo boats and so on. 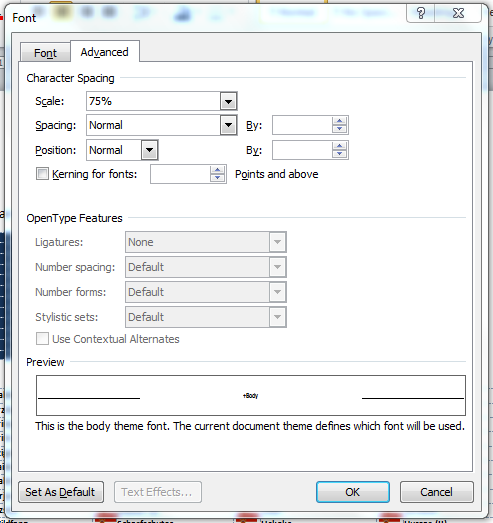 Go to home –> font –> advanced and set scale on character spacing to 75%. It does make the label a little harder to read, but not impossible but also ensures that it will fit most bases. We have a sheet of labels. Save the document again and now it is ready for printing. Print on standard paper on a colour printer((OK, so I win a prize for stating the bleeding obvious but I needed the line in there for continuity)) and you are ready to stick on your models base. Note that if you are using spray varnish, go right ahead and stick. If you are using varnish applied by a brush, then test first to see if the varnish will make the label run, especially if you have used an ink jet printer rather than a laser printer. Simply cut the little blue label from the sheet with a sharp knife (I use one of the ones with a snap-off blade as it is best done with a very sharp knife and paper blunts the knife fairly quickly). I attach the blue labels with a dob of white glue (the stuff that dries clear) and then when the glue is dry varnish the vessels. They can then be separated from the tongue depressors I use to hold the vessels whilst painting. Now you have labelled and varnished vessels. There is one final step. Using table three as a guide as it tells you which vessel is which code number, cut out and stick the vessel’s name label and ensign to the underside of the sea base. Voila! Finito! Pick up the ship, look underneath and you know the vessels name. Use the code number on the sea base label to identify for damage and firing results during a game. This is progressing nicely with 2/3rds of the vessels complete and a list of ships prepared ready for making labels for the navy. So, that is the destroyers complete and most of the battleships plus a few armoured cruisers. The rest of the armoured cruisers, the protected cruisers and the Japanese cruisers (can’t remember why I have them) are almost complete – they are the ones shown in the picture below. All that remains to be done on them is their lifeboat covers and the sooty funnels tops and such. All vessels will be given a few days for the paint to really dry (well, the truth is I am off to Indonesia on Tuesday for a couple of days) and then I will glue the labels on the tab at the back of the base. Vessels are then varnished – I use Vallejo Satin Varnish for ships as it gives them a nice moist appearance. The vessels are then removed from the tongue depressors and a name tag stuck to the bottom. They should be ready for posting Monday of next week with a bit of luck and a good following wind! 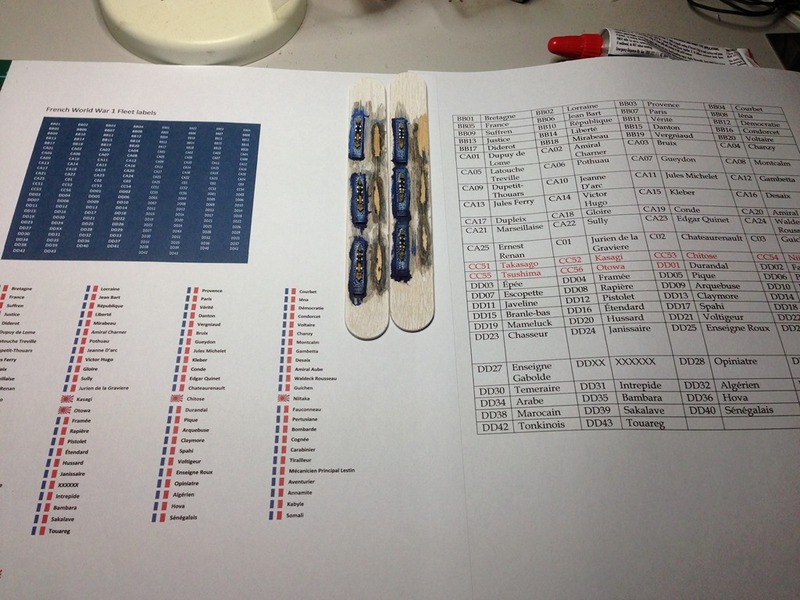 I’ve been working on the French World War One fleet pack from Hallmark ((available from Magister Militum in the UK)) for John in the US. These have been on the painting table for over two years now, business trips, the 15mm ACW and life generally having cut back the painting time I had available. As with the other Hallmark vessels I’ve painted, these models are quite nice with a surprising amount of detail for a vessel that is only 2cms long. They are quite easy to paint oddly enough and the process I have been using is to undercoat the vessels and bases in white, then wash in black ink (or nurgle gurlge slimy oil – whatever the Citadel black wash from Games Workshop is called these days). 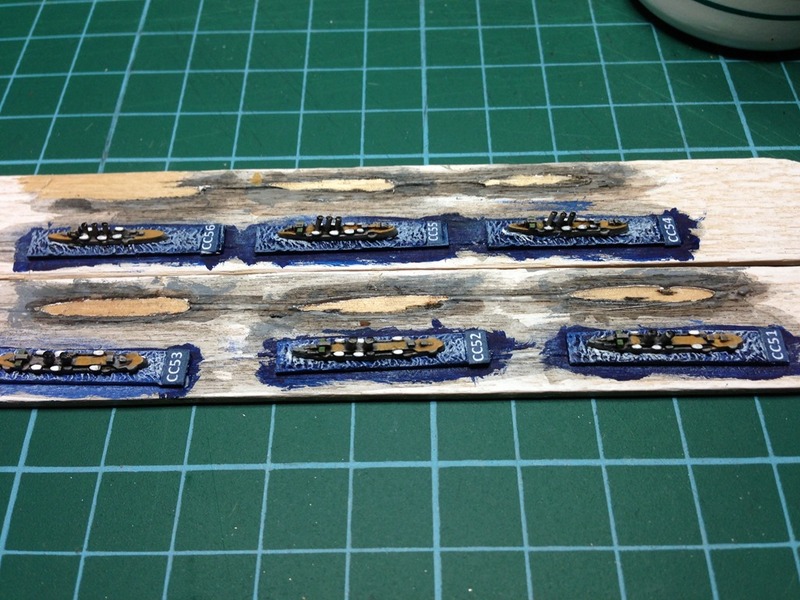 I then paint the sea bases (some on smaller vessels like torpedo boats are already with the vessel, others like the battleships have a separate base. Painting the base first is useful as I am slapping the colour around and it doesn’t matter if it spills onto the vessel at this point. 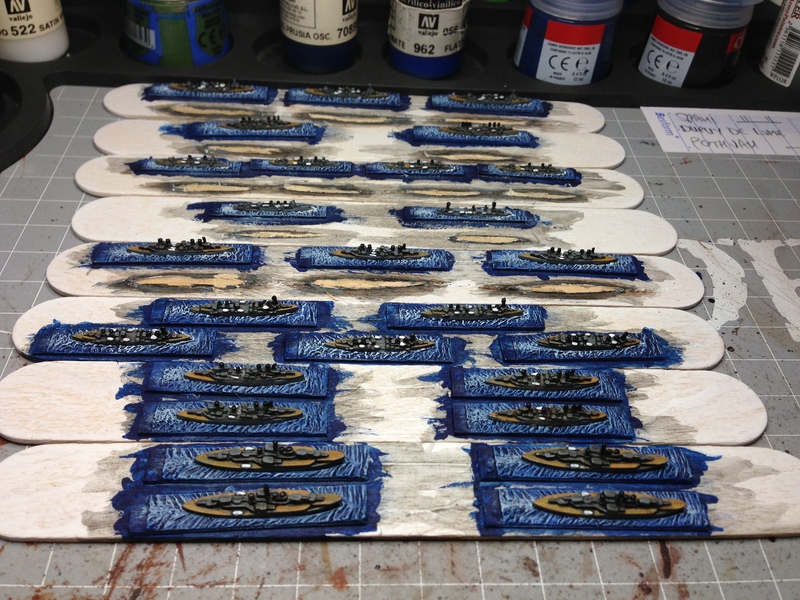 The colour used for the sea bases are then a heavy coat of Prussian Blue, a heavy dry brush of mid blue and lastly a dry brush of white – heave around the wake against what will be the side of the vessel and where the wake from the propellers will be seen, light elsewhere. For the battleships and cruisers I do a heavy wet brush in a mid grey (uniform grey in this case) followed by a second black wash. A light dry brush of the uniform grey is then done and yes, I know it is the third time I have added uniform grey to the vessel. The decks are then picked out and on the French vessels I am using a desert sand colour for the decks. The vessel is then given a brown wash (earthy dirty brown or whatever from Citadel again). The last step is then to pick out the funnel tops and the ships boats. I am using white for the canvas covers of the ships boats as although it was likely a darker colour, on vessels this size it looks right and enables the detail to be seen from a distance. I decided on uniform grey for the ship colour as the best information I could find on French vessels in World War 1 suggested an all over mid grey. French ships discipline also revolved around painting one turret in used cooking oil from the galley but I haven’t decided whether to go that far yet as to “bronze” one of the turret sides. Other colours I read about were a dark hull grey hull and a light grey superstructure but I opted for the all-over grey as it seemed to agree with the pictures I saw online. About 2/3rds of the vessels are now painted. I have about 30 left to paint. 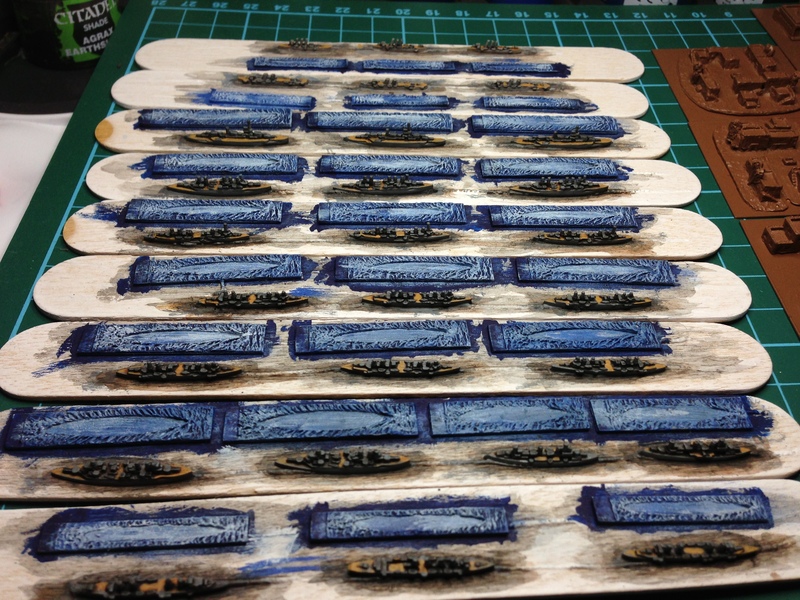 After that it is a case of making and printing the ship labels, adhering the ship number to the back of the base and then varnishing the vessels using a satin varnish. The last step is gluing the ship’s name under the base and then they will be finished yay! On the bench at the moment, John’s 1/6000 French World War 1 fleet. Progress today has been good with the sea bases all finished and the ships having had their first wash. 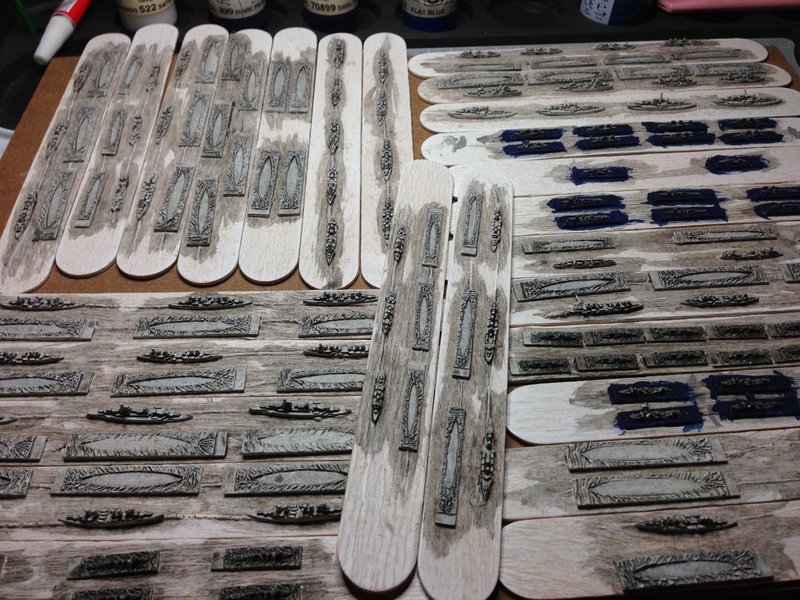 The destroyers and torpedo boats have had paint as well. So have 13 battleships. 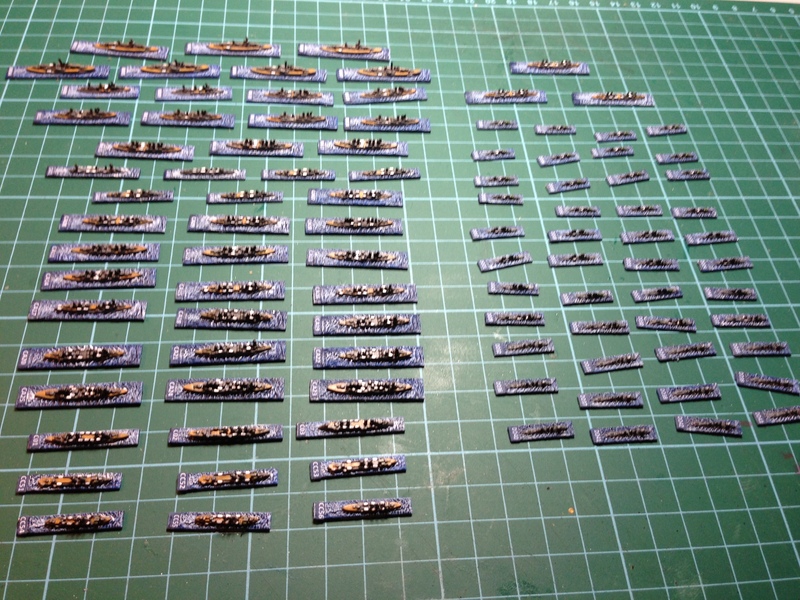 Currently there are 44 destroyers and torpedo boats that I expect to have finished tonight (well, finished except for the labels and final varnishing). Also being worked on is 55 battleships and cruisers. I am hoping to have them finished except for labels tomorrow night, as I am off to Jakarta for a few days again on Tuesday. For the curious, the squares on the mat on the painting table are 1cm square so that will give you an idea of the size of the vessels. If it was September I’d put it down to Spring cleaning. However, it’s January. I’m madly rebasing figures to get ready for Cancon 2011 so I guess what just happened here is a product of a cup of coffee along with my desire to procrastinate on the rebasing. I thought, “I must have a look and decide whether I will try and paint a new DBA army for Cancon 2011 or shall I just make one from my existing painted figures”. I remembered that I had some figures in the other room but could not remember exactly which DBA armies they were. I recall writing something up in my blog several years about the armies that I had but I also knew that I had purchased the odd figure or two since then. I decided to have a quick look. I started looking in the stock figures box where I have unpainted armies neatly stored in plastic, Tupperware like containers. I grabbed one box of DBA figures then opened a second box to see if there was any DBA figures in there. The figures there were for the Hittite Empire and were a DBM army I had forgotten I had to paint. I decided then that I needed a survey of my painting queue. My goodness, this is what I found (and remember, this is just what I have here, it doesn’t count the figures I have at my Mum’s still to paint as well – those are mostly fantasy and American Civil War). I had collected many DBM armies when I was living in the UK – being paid in pounds made the purchases relatively inexpensive compared to buying them from Oz. Of course, the plan was to settle in to painting them all but so far I’ve not managed it yet. The figures are from Museum Miniatures, Chariot (now Magister Militum) and Essex Miniatures. So far I have avoided book IV armies in DBMM. 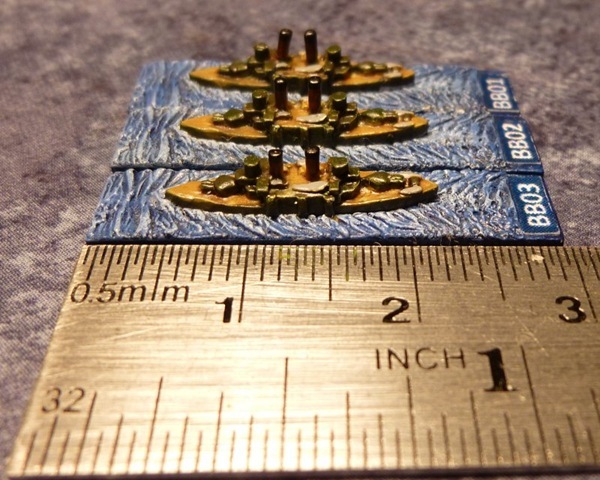 and the French WWI Navy in 1/6000th scale for John in the US. With the exception of the WWII Russians and the 15mm Campaign DBA sets I’ve started building, I think I will call a hiatus on figure purchases this year, at least until I get to reduce the painting queue a little. So, too many figures to paint? Nah, you can never have enough. 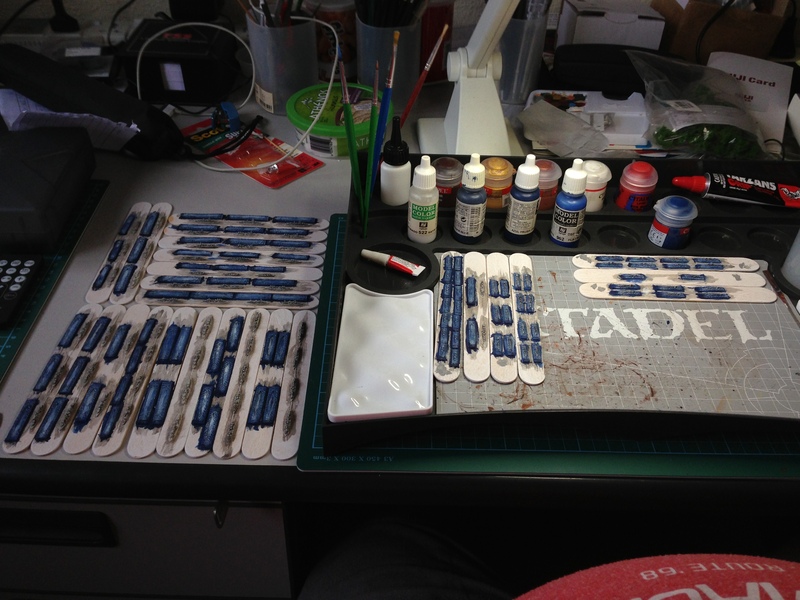 I’ve been painting 1/6000th scale ships again for John in the US. This time it was the main vessels of the Austrian World War 1 fleet (well, minus a few torpedo boats that I painted with his Italians). For something a little different, the older vessels were painted in the pre-war colours of the Austrian fleet, a dark green whilst the newer vessels were all painted in the colour scheme of the fleet during World War 1. Also included where four cargo ships – targets for some future game. As these vessels are 1/6000th scale, they are quite small, as you can see with the Habsburg class battleships in the photo to the right. These little beauties are about 1.75 cm long in size. Incidentally, they are painted in the dark green colour. The next batch of ships from him will be the French from World War 1. 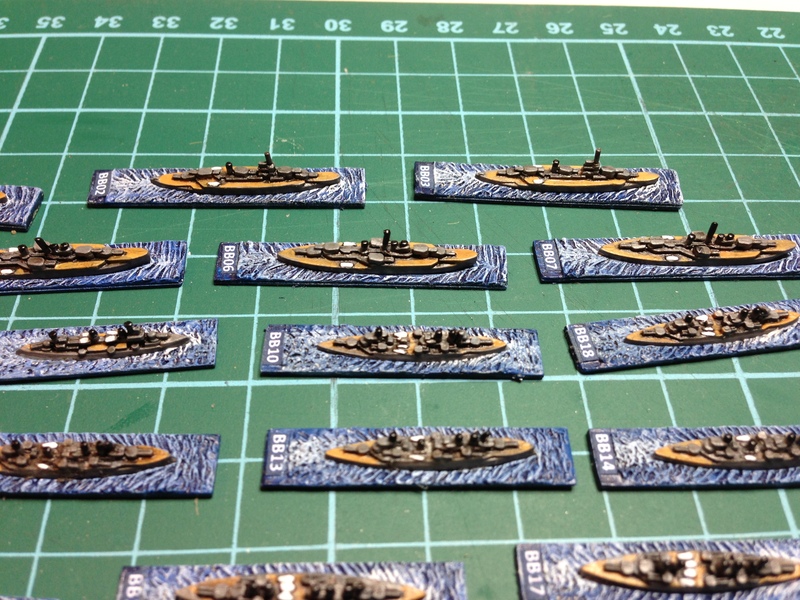 In the meantime I have some other ships to finish for Lee and a bazillion 6mm Prussians for me. Back to the paint table!